About a year or so ago someone wrote me and told me that One Boy’s Struggle would become a cult classic. As per the usual with me I didn’t pay that complement much attention (yep – A.D.D.). It was a complement, right? Then a few weeks ago someone else wrote me and said nearly the same thing and then again, just last week yet another person called it a cult classic. The latest person didn’t even say it would be or could be, she said it is a cult classic! She was pretty much a-matter-of-fact about it. The first thoughts that came to mind when I read the definitions is that One Boy’s Struggle is not fiction and the word ‘cult’ doesn’t seem complementary. 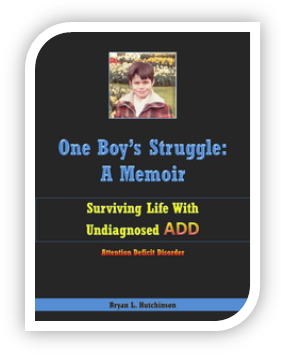 One Boy’s Struggle is a memoir and therefore, non-fiction and it isn’t a movie. I know, a bit picky of me, but we ADDers tend to be perfectionists to a fault. However, if I ignore my uncertainty for the word ‘cult’ and get past the ‘fiction’ part and put in ‘non-fiction’ the definition is pretty much true. There really is no other book like One Boy’s Struggle either. Not dealing with ADHD, PTSD, a child’s struggle into adulthood and beyond, or much less anything else for that matter. How could there be? It is the story of my life, after all. It is a story of hope, spawned from tragedy, but it is not a novel or a character driven play. It is the assemblage of real life notes of a life that was in jeopardy, from someone who was trying to figure it all out and put his life (back) together. Still, I have discovered something else and because of what I have discovered I can no longer be entirely certain that it is the story of my life anymore. No, I haven’t gone crazy, in fact, quite the opposite. Things are clearer for me today than they ever have been and I must admit, I give special thanks to the readers of One Boy’s Struggle, because, it is not simply my story anymore. It is your story too. So many people have written me asking if I am their long lost twin or relative. Even people who do not agree with everything I write concerning ADHD, or, my ideas, but they relate to the situations I lived through, my actions and my reactions and the actions and reactions of those around me who were affected by my ADD (odd) behaviors. Behaviors, which are all too common in those of us who have ADD or ADHD! In other words I have found that, like me, a lot of other people are discovering themselves through a series of notes about a person’s life that were put together to form something of a book, but it isn’t really a book at all. And, if it is not actually a book, what is it then? It is me and perhaps, in a chapter or more, or a few pages, or a few sentences, it is you too? I am humbled and honored for the consideration, but I ask you: Do you think One Boy’s Struggle is a cult classic? I guess time will tell and you will be part of that telling. I have decided to go back and write a new afterward for One Boy’s Struggle, called: 4 years later. I had also considered rewriting the book itself, a bit, to add some things people have asked me over the last few years, but after some serious consideration I have decided to allow One Boy’s Struggle to be what it is without any modifications. Besides, the rest of my story continues to be written in the books that follow and online here on ADDerWorld.com. Thank you, dear reader, for reading my writings and being a part of my self-restoration, and perhaps yours, your partner’s or your child’s as well. I was seriously worried when I published One Boy’s Struggle that I would be cut down, criticised and further ridiculed, and to a lesser degree that has happened, but for the most part feedback has been out of this world better than I ever could have dreamed of!! THANK YOU SO VERY MUCH!! Next post: Does Lindsay Lohan have ADHD? 90 days Jail time prescribed for her.